The new Bloom Energy, 6 megawatt (MW) installation, is currently being designed and engineered into eBay’s expanded data center facility in Utah and if the schedule is kept will be fully functional by mid-2013. The 30 Bloom Energy servers will be installed a few hundred feet from the data center and will generate approximately 1.75 million kilowatt hours (kWh) of electricity annually. 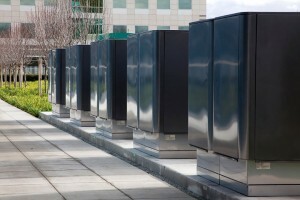 The fuel cells from Bloom Energy will generate on-site power 24 hours a day, 365 days a year, and will replace large and expensive backup generators, and UPS components, that are historically utilized less than 1 percent of the year. This new energy project with Bloom Energy with be eBays largest renewable energy installation. eBay already operates a 650 kilowatt (kW) solar array, a 500 kW Bloom fuel cell installation at its San Jose headquarters, as well as a 100 kW solar array at its Denver data center. Previously this year the company also installed a 665 kW solar array spanning 72,000 square feet atop its existing, LEED® certified Utah data center. eBay may not be on the U.S. Environmental Protection Agency (EPA) list of Top 50 Green-Powered Organizations currently, but if they continue on this path they might just be heading for a good spot in the future. Large Data Centers are well known to consume huge amounts of power so it’s promising to see that large organisations like eBay are actively looking in ways to increase the use of more sustainable resources.